Did you own more than one Elvis doll growing up? I did. They were my 'Ken', Ken was a little fem for my taste (but he did do a fabulous job decorating Stacy's new condo!) One was Jailhouse Rock Elvis, in a red satin jacket, open collar white shirt, and acoustic guitar. The other was leathah Elvis, black jacket, v-neck tee, and aggressively high pompadour. I was even into mens fashion in the Barbie years. 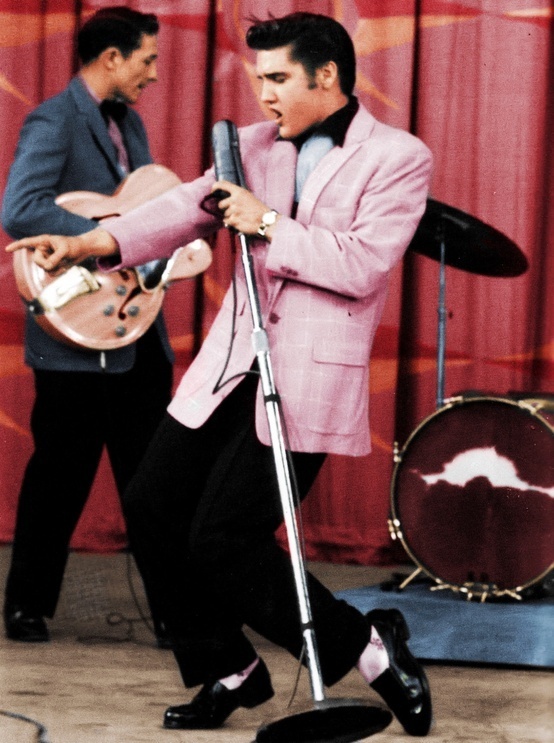 But Elvis was a stylish guy, even in his more bloated years he knew how to rock a stage look. 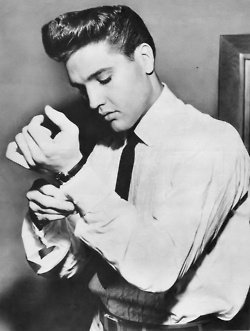 But young Elvis… swoon. Remember, these were the days before there were stylists, like myself, hired to shop for, and layout every outfit for a celebrity- Elvis' look was all him.